Swasey Mountain rises roughly 35 miles west of Delta, comprising the gorgeous northern arm of the House Mountain Range. The ridgeline, striped in broad bands of purple, gray and white, stretches nearly fifteen miles from Sand Pass, just inside Juab County, southward to Death Canyon, about 15 miles north of Notch Peak. 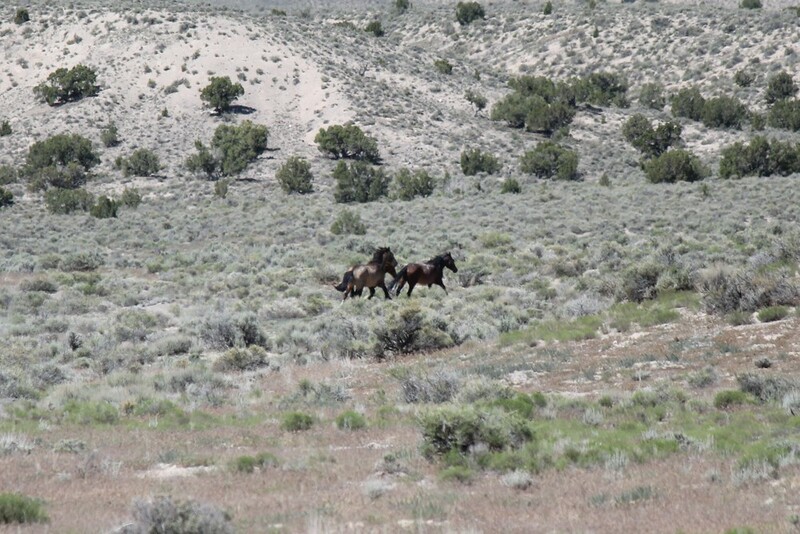 This is the closest herd area to Delta, and your odds for spotting a few mustangs here are pretty good on any given day. Swasey separates the Sevier Desert, on the eastern side, from Tule Valley, to the west. 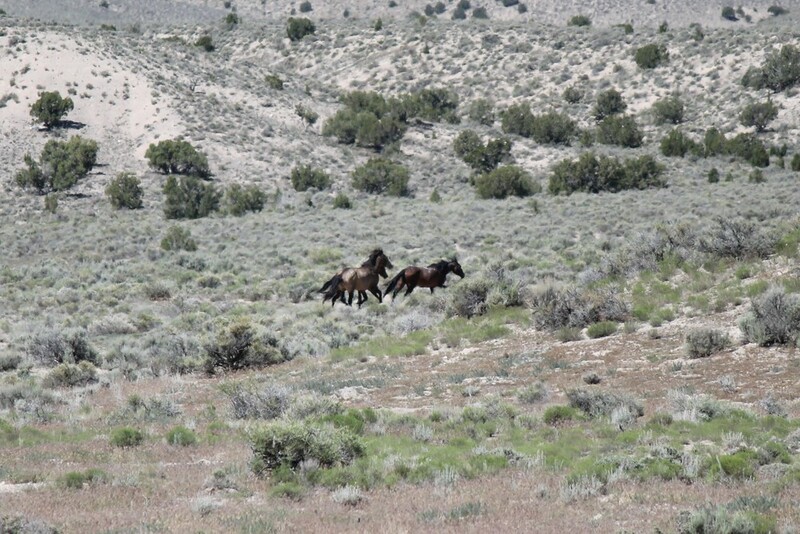 The managed herd area occupies the entirety of Swasey's eastern bench, essentially running from the Old US 6 & 50 northward to Weis Highway, a few miles beyond the Juab County border. 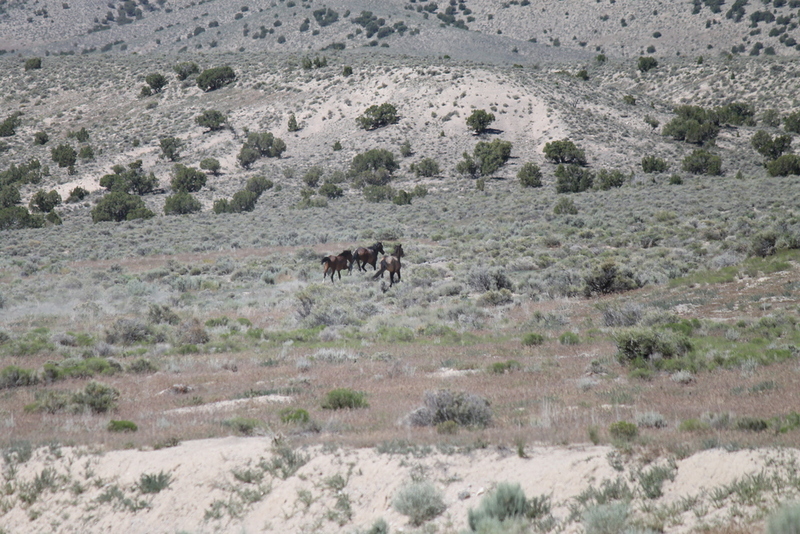 I have spotted herd members throughout, from roadside along the Old 6 & 50 to the foothills just inside Juab County. The Amasa Basin OHV trails lie south of this herd area, between the old and new 6 & 50. Death Canyon is also relatively popular among off-roaders, and U-Dig Fossils, at the mouth of this canyon, draws tourists interested in a pay-to-dig fossil hunting experience. North of these attractions, humans become increasingly scarce. From Delta, you have two options: US 6 & 50 (30 miles paved, 15½ miles gravel) or the Old 6 & 50 (10 miles paved, 27½ miles gravel). Either route is easily driven in the family sedan, given dry conditions. For the predominantly paved route, follow US 6& 50 west from Delta to the Long Ridge Reservoir turnoff -- watch for the sign located between mile markers 56 and 57. Follow this gravel road a little over 15 miles (toward U-Dig Fossils) to the crossroads at Antelope Spring. As you approach the reservoir, about 6.5 miles in, the road turns sharply west before forking northward again. If you miss this fork, just continue another 1.6 miles until the road you are on ends in a T-intersection and turn right. This road will merge with your intended route about 1.7 miles further along. Note that this road becomes Death Canyon Road as you approach the Old 6 & 50. You will cross the old highway about 10.4 miles in. For the more direct route, begin on US 6 & 50, taking the turnoff to the Old 6 & 50 about 10 miles west of the Delta city limits. This turnoff is not marked, so watch for it on your right as you approach mile marker 76. This well-maintained gravel road begins north, but turns westward about 1/4 mile in. Follow this road about 22.7 miles to the intersection with the road to Death Canyon, Antelope Spring and U-Dig Fossils. Turn right (north), and continue just under 5 miles to the crossroads at Antelope Spring. 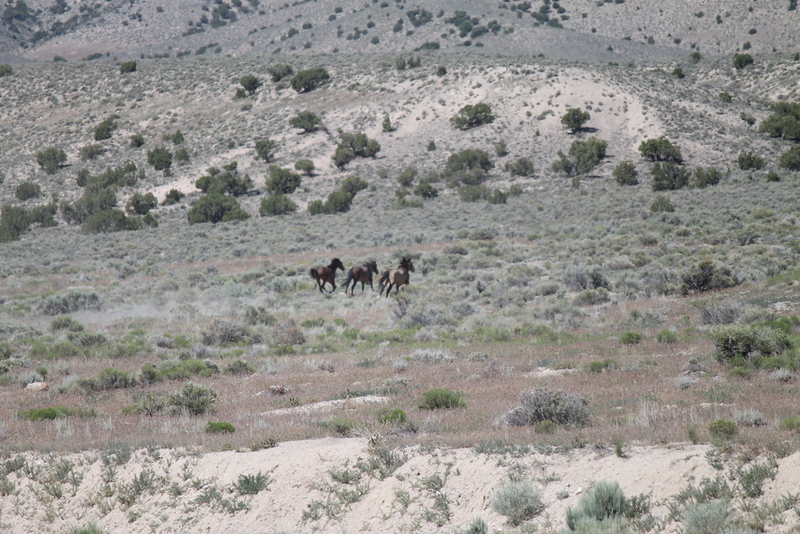 The photos further down this page of the band casually grazing with their red foal were taken from the road a few hundred feet east of the Antelope Spring crossroad. Turn right at Antelope Spring, and follow Swasey Springs Road as it curves northward around the foot of Swasey Mountain. Horses may appear anywhere between this road and the foothills to the west for the next twenty-five miles. Keep left on Swasey Springs Road as you pass the fork to Laird Peak, 13.8 miles beyond the Antelope Spring crossroad, and left again onto East Spring Road 5 miles later. From this point, the road begins to undulate through knolls and washes, but remains easily navigable. Continue another 10.5 miles as the road turns westward toward the T-intersection with Sand Pass Road. This marks the northern perimeter of the Swasey herd area. Now turn right and travel north 1.4 miles to Weis Highway, another wide, well-maintained gravel road reminiscent of the Old 6 & 50. Turn right on Weis Highway, and continue 15 miles to Brush Highway (aka Brush Beryllium), where pavement begins. Follow the Brush Highway 40.7 miles, past the Intermountain Power facility to US 6. At the stop sign, turn right to return to Delta (10 miles southwest) or left for Provo (80 miles northeast) and Salt Lake City (120 miles northeast). The entire loop from Delta and back will run between 134 and 142 miles, depending upon which route you start out on. A little over half of this journey will be on dirt and gravel roads, so plan on at least 3½ hours of actual driving time. And, of course, you will find no gas, food or water along the way, so plan accordingly. As noted earlier, I've seen bands throughout Swasey, even grazing along the south side of the Old 6 & 50. The 5 mile stretch from the old highway to the Antelope Spring crossroad has been very good to me, but keep a watchful eye all the way to Weis Highway. These beauties love to roam! You will notice numerous roads along the described route leading into the foothills. Finding a nice location for undeveloped camping in one of these charming little canyons is fairly easy. U-Dig Fossils, situated in Swasey's the southern foot, offers paying visitors the opportunity to hunt trilobite fossils in their prolific shale deposits. The Amasa Valley OHV trails are a popular destination for off-roaders. This herd area is included in The House Range Loop day trip tour.